Leave a pianist to his own devices and he is likely to lose himself in the keyboard of the grand instrument. Leave Jovino Santos Neto alone with a piano and there is no telling where that grand instrument will take him either. Moreover, it would seem certain that the virtuoso might be led by his metaphysical spirit and his mystical soul to land he knows best: The great country of Brazil. However, this is not necessarily so. Mr. Santos Neto is a Brazilian, for sure, but he is also a pianist and musician in the most creative and broadest sense of the terms. He has a vision of the world and a perspective that encompasses almost every idiom in music—from the classical era to the contemporary one. He has the heart and soul of a Brazilian artist and there is no doubt about that. His style is percussive and he expresses himself in an almost vocal manner. His bass lines are thunderous, like the surdo sometimes and his right-hand runs and rippling arpeggios might sound as delicate as a cuica or like a pair of lips running through glad tidings like a joyful vocalist running down a lyric with what in Portuguese is expressed as Saudade. Dreaming of music, or better still, dreaming music seems to be the first and foremost raison d’être of Mr. Santos Neto’s tour de force, Adventure Music Piano Masters Vol. 4. And such is the power of his entrancing odyssey that it is impossible to resist falling prey to his hypnotic charms. With sweeping gestures and yet sublime control, Mr. Santos Neto achieves what might be called a kind of state of grace as he allows his itinerant spirit to flow as if it were engulfed by as Amazonian swirl that causes his soul to roam free of the confines even of Brazil. Yet when the pianist arrives crossroads where his Brazilian-ness is confronted with his European sensibility his defenses drop completely allowing him to let the spirit of classicism into his heart, thereby turning the language of the music into a wondrous artistic sojourn. This is clearly the case in “All The Things You Are”. Here Mr. Jovino Santos Neto transforms this into something resembling a sentimental journey that leads from the America to the deepest and most rhythm-driven parts of the country where he was born and from where he derives his rare expressiveness. This is also true of “What Is This Thing Called Love” an emotional favourite of instrumentalists from Charles Mingus to Keith Jarrett. It is in this chart of course that Mr. Santos Neto expresses the depth of his percussive nature as a pianist, while also dazzling the mind’s ear with melodic as well as harmonic invention. Another aspect of Jovino Santos Neto’s playing is his sense of sweeping musical vision. While this aspect of expression might come to a pianist advanced in years, it seems to have been almost inborn in Mr. Santos Neto. This characteristic of his pianism comes into being as he navigates the complexities of Hermeto Pascoal’s exquisite composition, “Bebê”. With an almost baroque opening to the chart; with layer upon layer of beautiful counterpoint, Mr. Santos Neto creates a majestic architecture built of melody and intricate harmony and then crowns all of this with the puckish rhythm that runs in and out of the contrapuntal spaces that the pianist creates and inhabits throughout the song. Thus the pianist makes an eminently recognizable Brazilian chart so completely his own that it reverberates with a refreshing newness. Of course nothing less would be expected of Mr. Santos Neto, who was once the music director of a fabled ensemble fronted by none other than the great Hermeto Pascoal himself. But Mr. Santos Neto is so intrinsically Brazilian; so immersed in his worldly Brazilian-ness that he also imparts whole measures of his wandering soul to music by Edu Lobo and Chico Buarque (“Bandido Choro”) as well as to Baden Powell (“Samba Triste”) which flows with elemental melancholia. There is also the beating heart of Brazil: Ary Barroso who is sanctified with “Na Batucada da Vida”. Jovino Santos Neto, the composer, is an essential part of the Brazilian continuum. His delightful vignettes, “Semente,” “Surgindo,” “Gosto,” “Sempre” and “Muito” seem to cast him as a composer so attuned to the interior landscape of the musician’s mind that these four short pieces emerge as what could easily be the germination of a broader dialogue between musician and instrument. Perhaps a longer work would be forthcoming should the pianist so desire. If this happens to come into being it would owe inspiration in no small measure to these wonderful studies that delve into the metaphysical and also into the abstract nature of things. 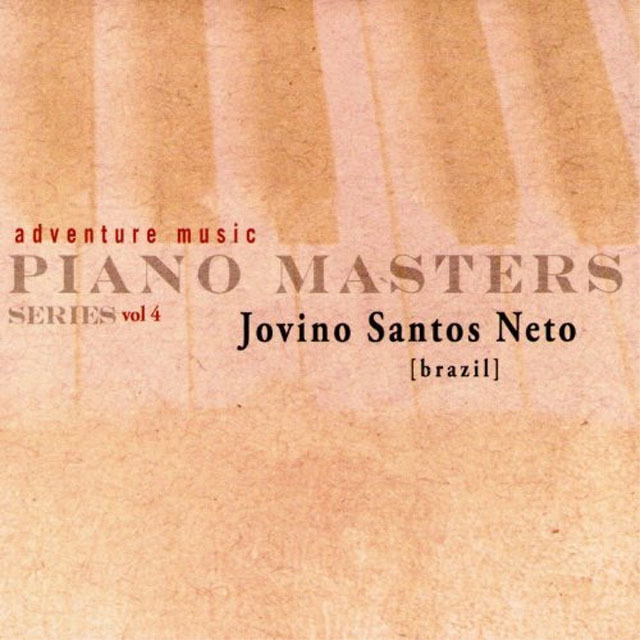 That Jovino Santos Neto is in intellect that is also of considerable pianistic skill and expressiveness is something that is conclusively proven with these and other works that he performs on this exquisite album. Tracks: Blackbird; Semente (Seed); Hoping For The Day; Crescendo (Growing); All The Things You Are; Samba Triste (Sad Samba); Surgindo (Sprouting); Bandido Choro (Bandit Choro); Do Solo (From The Earth); Samba De Uma Nota So (One Note Samba); Descanso (Rest); Amanha (Tomorrow); What Is This Thing Called Love? ; Bebê (Baby); Gosto (Flavor); My Funny Valentine; Sempre (Always); Na Batucada Da Vida (In The Drumming Of Life); Muito (Much); Nem Um Talvez (Not Even A Maybe). Personnel: Jovino Santos Neto: piano.